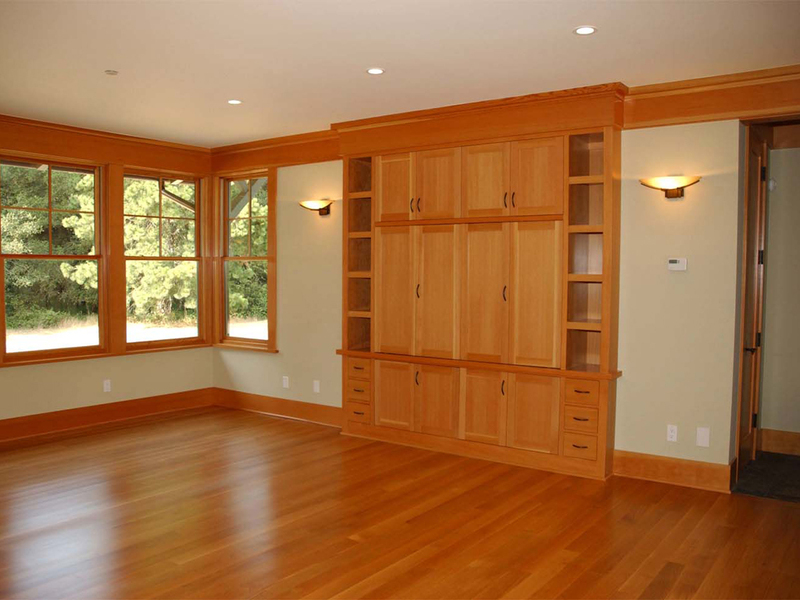 Architectural wood casework refers to the cabinets or built-ins we use for storage in both residential and commercial buildings. Depending on the project type, the casework can have straight lines and plain finishes or be a specific style with ornate finishes. Cabinets can have open shelves, drawers or doors, and can be installed on the wall or floor, against a wall, or in the middle of a room with a counter above. Cabinets and built-ins are shop fabricated or manufactured products that can be one of three production types: custom, semi-custom or stock. High quality custom casework is designed, ordered and built (in 6 to 12 weeks) from hand-selected, reclaimed, exotic or traditional woods. Typically, custom casework has the highest cost. Semi-custom casework cost is commonly in between custom and stock casework. It is selected from a catalog, ordered and delivered (in 4-6 weeks). Semi-custom casework can also be high in quality and could be constructed from solid wood, plywood, or engineered wood. Depending on the style and finish desired, the product may have a solid wood, wood-veneer faced or plastic-laminate-clad finish. 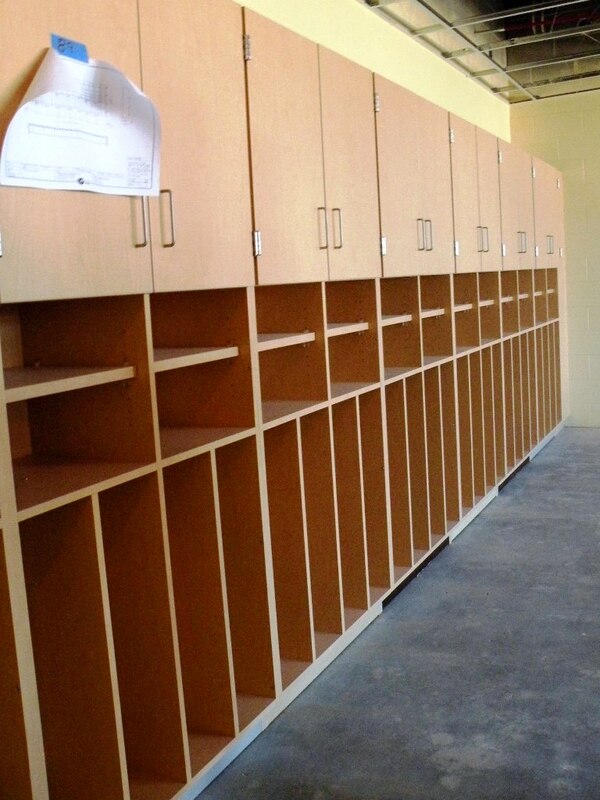 Stock casework is able to be selected off of the shelf and may be assembled or ready to assemble. Limited options are available with stock casework and the cabinets are typically constructed out of engineered wood with a laminate finish. Semi-custom and stock products are constructed in conformance with industry standards, while custom cabinets can be built to design specifications. Industry standard base cabinet size is 34 1/2 inches high and 24 inches deep. The width can be 6 inches to 48 inches wide and increases in size by 3 inch increments. Traditional solid wood cabinet species include: Maple, Cherry, Oak, Pine, Alder, Birch, Hickory, Mahogany, Walnut, Ebony, Ash, Beech, Elm, Chestnut, Butternut, Rosewood and Teak. Solid wood cabinets are most often stained to showcase the natural wood grain, but can also be painted, glazed, polyestered, or oil rubbed. Stains can be transparent, semi-transparent, semi-opaque or opaque. When staining casework, it is important to apply a protective finish coat over the stain. 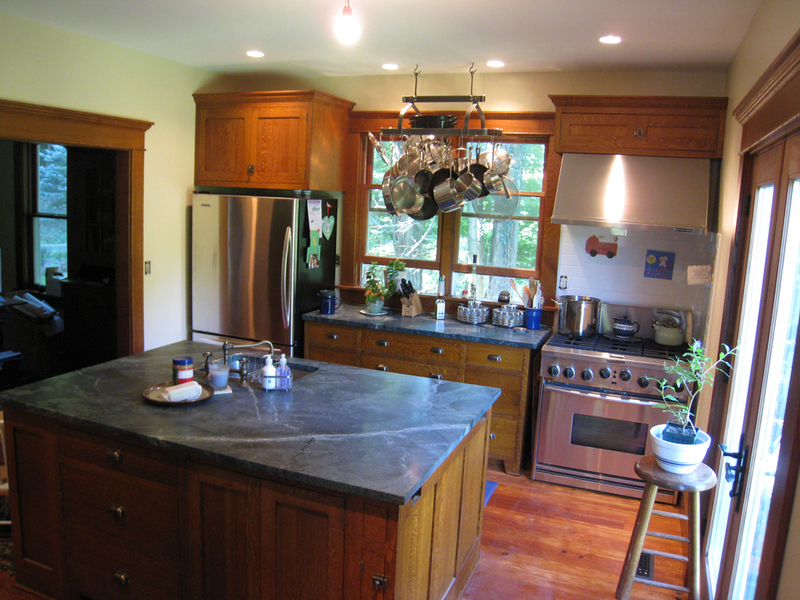 Painting cabinets provides a range of options for color, texture, sheen and special effect finishes. 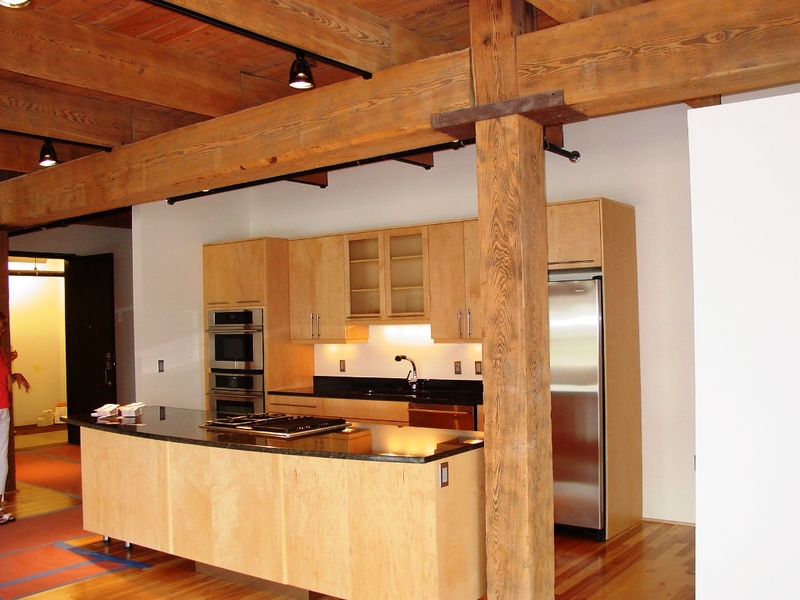 Glaze can be tinted to any color and applied to either stained, painted or bare casework. Polyester finish is similar to paint, although it is more expensive due to labor. Polyester requires more wood preparation and sanding between coats, and the final coat requires a protective coating. Oil rubbed finishes are very time and labor intensive and require multiple coats. Similar in preparation to staining, oil rubbed finishes enhance the natural grain of the wood but do not require a protective finish coat. Wood-veneered cabinets have a thin sheet of wood that has been peeled from a log attached to the surface of plywood, MDF or particleboard. Veneered casework is less expensive than solid wood, but offers a uniform finish with patterns across surfaces. It is more stable than wood. Matching patterns can be book, slip, random, balanced or running matched veneers. Veneers are typically stained. Plastic-laminate-clad is a hard material composed of kraft paper, resins and coating that is attached to the surface of plywood or particleboard. Laminated casework is the least expensive option for cabinets; however, it offers an easy to clean, durable product in many colors, patterns and textures. Common issues such as chipping and tearing in the plastic-laminate-clad can be easily repaired. 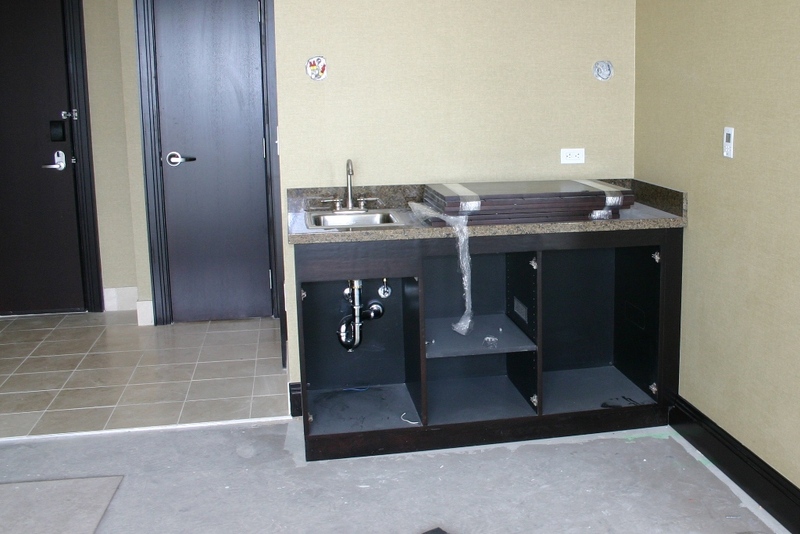 Casework can easily be installed by a do it yourself homeowner or a professional. Depending on the size of the project, the time to install can be accomplished in one to two days. Assuming you are working with a flat, true horizontal floor and vertical floor surfaces, the first step of installation is to lay out the base or wall cabinets on the wall surface. Using a level, each base and wall cabinet can be set in place. Base cabinets should be shimmed to a desired height and base and wall cabinets shimmed to a desired depth from the wall to ensure a level installation. Cabinets should be installed one at time and fastened into both the wall studs and adjacent cabinets. Gaps between cabinets, appliances, and walls can be filled using a filler strip ripped to width. 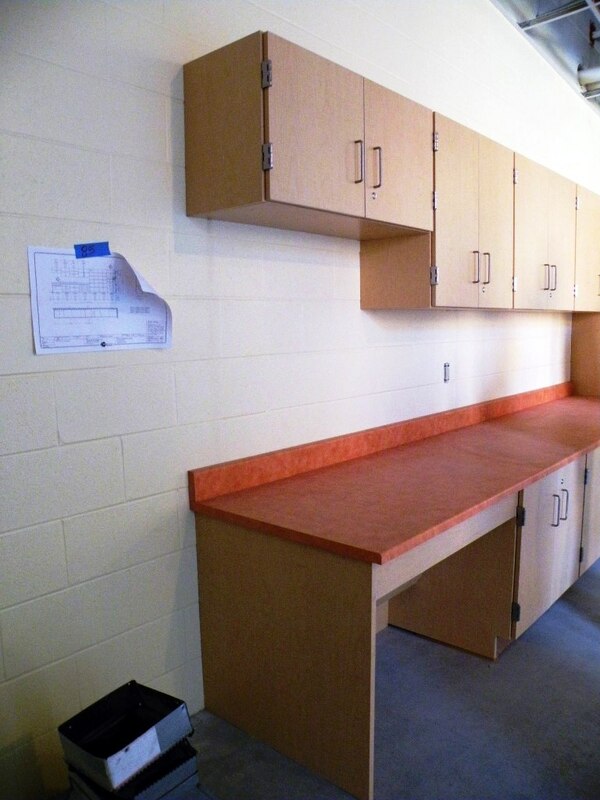 Cabinets installed in the middle of a room require the use of floor blocks to secure the cabinet to the floor. 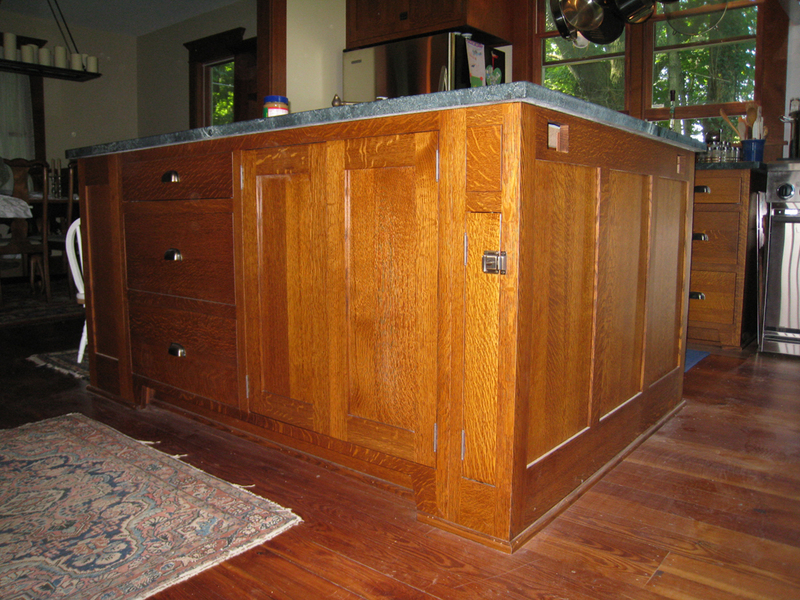 Architectural wood casework may have integral pulls or require pull and knob hardware. There are an enormous number of hardware styles and types available on the market today. Common finishes include: Polished Chrome, Oil Rubbed Bronze, Satin Nickel, Brushed Nickel, Stainless Steel, Zinc Polished Brass, Antique Brass, Polished Brass and Antique Copper. Cabinet hardware is installed by drilling the necessary holes and tightening screws on the inside surface, drawing in the pull or knob on the outside surface.